Our Annual Review contains information about the work we’ve been doing, ranging from prevention of blindness to advocacy, and explains exactly how we’ve been spending your money. Our financial statements are also available in the Annual Review. Sightsavers in India has been accredited by the ‘Credibility Alliance’ for adhering to all the desired good practices in the NGO governance and management space. Please click here to view the accreditation certificate. A remarkable 2017 has been behind us. Our theme ‘Eye Can’ is very apt for the series of phenomenon that took place in the last year. We witnessed start of the European Union project in India to facilitate a conducive policy dialogue space between Disabled People Organisations (DPOs) especially focusing on engaging more women with disabilities. This action will support building of strategic networks. Sightsavers launched one of the largest eye health programmes for truckers’ community-RAAHI. With the goal to reach out to 500,000 truckers across 29 locations along the golden quadrilateral, RAAHI is going to be a sizeable programme for all of us here at Sightsavers. The survey publication titled ‘Eyes OK Please!’ was released for wider dissemination to create awareness about the need for RAAHI in September 2017. Sightsavers marked its 50th anniversary in India in the month of September, 2016. The golden jubilee gala in Delhi was attended by VIPs, dignitaries and beneficiaries.The prelude to finale celebrations were held in Ranchi, Jaipur and Bhubaneswar during the previous months. The occasion was widely covered by several coveted newspapers and magazines including The Hindu, The Indian Express, Deccan Herald and The Week among others. Year 2016-17 has been a year of intense action on the ground post the previous two years of conceptualisation and initiation, wherein some of the key achievements have been the consolidation of our Urban Eye Health programme and commencement of interventions in new cities. Our social inclusion programme has expanded into all the districts and has even completed the livelihood mapping and formation of many of the SHGs as planned. The systems strengthening process has taken off in the Rural Eye Health programme with the completion of the District Eye Health Assessment process using DEHAT. It has been a year of partnerships and collaboration with State Governments endorsing and adopting our models. Since our aim is to build sustainable systems that work at scale, we are delighted that more of our vision centres are now being integrated within the primary health centres. In Bihar, for example, our collaboration with the district hospital in Kishanganj, which saw a marked improvement in the delivery of eye health services, is now being replicated in seven other districts. In 2015, keeping with our core commitment to eliminating avoidable blindness, Sightsavers conducted approximately 1.6 million eye screenings and performed 1,32,144 sight restoration surgeries. In all, more than 1,22,138 spectacles were given to people in need. We continue our efforts to uphold the rights of the disabled. In five states, we have prioritised technical support to the Sarva Shiksha Abhiyan for training and capacity building of teachers to address the education needs of Children with Disabilities (CWDs) with focus on children with visual impairment. We have doubled the number of sight-restoring surgeries performed over the previous year, making it the highest growth ever in our capacities in a single year. Additionally, the vision for change identified in our reworked national strategy began to take concrete shape in 2014. We launched six national programmes; rural, urban and school eye health; low vision; inclusive education; and social inclusion. In particular, Vidyajyoti – our National School Eye Health programme – represented a major step in the right direction. 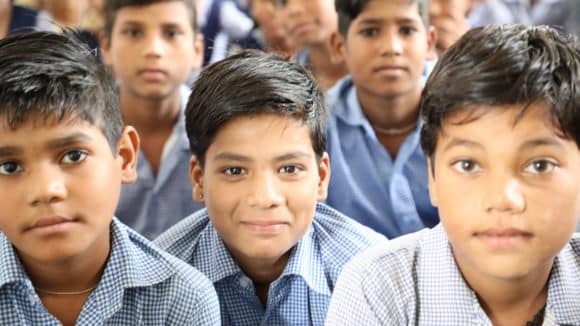 By integrating eye care with regular health initiatives in schools, we are not only addressing one of the leading causes of avoidable blindness (refractive error) at an early age, but are also contributing to improving the learning outcomes of children in school. Other landmark innovations from 2014 include a mobile boat eye clinic to reach remote communities in the Sunderbans, and portable eye screening devices to deliver fast and affordable eye care services in urban slums in Bangalore. The most important development of the year has been the development of a brand new strategy to guide our work over the next five years. The new strategy denotes a marked shift from a ‘service delivery’ to a ‘systems strengthening’ approach. Instead of providing solutions at an individual or local level, our interventions will be increasingly focussed on bridging the gaps in the existing machinery and building sustainable systems to take on eye health and disability-related challenges of the coming era. 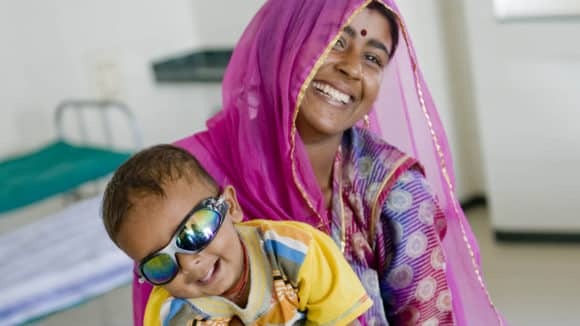 In 2013, Sightsavers reached out to 1.3 million people with potential eye problems, distributing 137,282 spectacles to people in need, and conducting sight-restoring surgeries for 82,I78 visually impaired people. In 2013, Sightsavers supported 1,903 Children with Visual Impairment (CVIs) in school. 16,915 disabled adults were provided various trainings to facilitate independent living. We continued efforts in lobbying with public and private sector banks to promote accessible banking yielded strong results, with over 7000 accessible ATMs being installed across the country. Our digital campaign on World Sight Day was another major success that significantly increased our presence on social media platforms. In 2012, Sightsavers has reached out to over 1.5 million persons with potential eye problems and over 510,000 persons have been treated as a result. Through partnerships and government tie-ups, we have managed to perform 77,084 eye operations and trained over 22,000 people on primary eyecare (including health workers and volunteers). This year, key initiatives like “Through Different Eyes” which aimed at raising awareness about avoidable blindness, was a great success. Innovative initiatives like the Sightsavers’ photo contest on Facebook was not only cherishing but engaging too. Yet another key initiative taken by Sightsavers India was the successful launch of ‘Vision Delhi’ project which will be implemented in partnership with Dr. R. P. Centre for Ophthalmic Sciences, AIIMS, New Delhi over the next three years. The project primarily targeted at the urban slums of East, South and West Delhi aims to demonstrate scalable cost effective approaches that contribute to addressing the unmet need for refractive error services.